ANNVILLE, PA – The Wilkes University football team has been picked to finish eighth in the annual Middle Atlantic Conference (MAC) Coaches' Poll released by the conference office Monday morning. The Colonels were selected eighth out of the ten-team conference with 27 total points in the poll. Delaware Valley University took the top spot in the poll with 75 points and five first place votes. 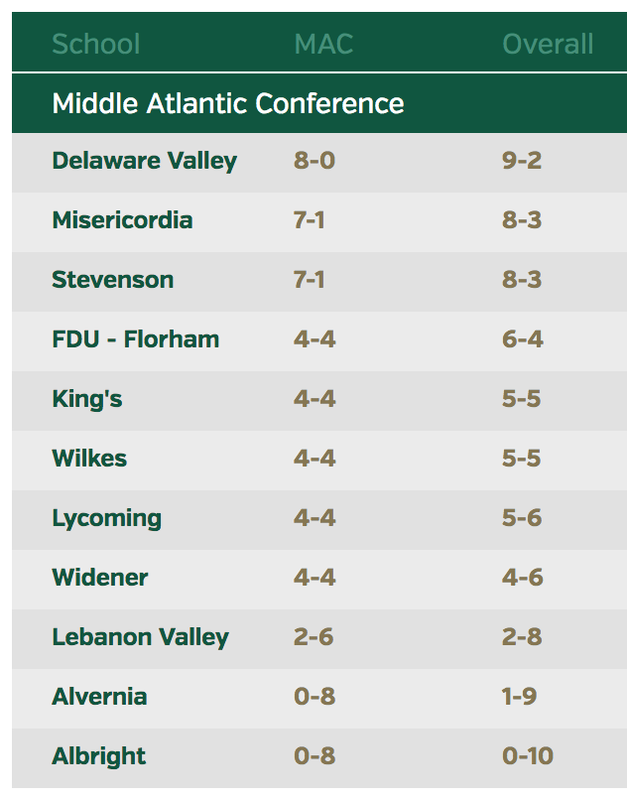 Defending MAC champion Stevenson University and Albright College were tied for second with 72 points each. Stevenson garnered three first place votes while Albright finished with two first place tallies. Widener University finished fourth with 55 points followed by King's College in fifth with 47 points and Lycoming in sixth with 38 points. Lebanon Valley was chosen seventh with 33 points. FDU-Florham (19 pts.) and Misericordia (12 pts.) rounded out the poll in ninth and tenth place respectively. Wilkes opens its 2017 campaign in Allentown, Pa. on Saturday, September 2 at Muhlenberg College at 1:00 p.m. The Colonels return home a week (September 9) later hosting Lebanon Valley in its MAC opener at 1:00 p.m. at Schmidt Stadium. Homecoming is set for Saturday, October 7 when the Colonels welcome Widener for a 1:00 p.m. MAC Contest.